Iraqi PM Nouri al-Maliki is fighting for his political life as well as for the territorial integrity of Iraq. On Saturday he launched a large military operation in an attempt to take back control of Tikrit (the capital of Salahuddin Province) just to the north of the capital, Baghdad. Al-Maliki has lost control of the areas around Baghdad, even to the south. But his forces kept a position in Samarra, pop. roughly 250,000, a largely Sunni city north of the capital that has a crucial Shiite shrine. The current campaign seems also to involve an army attempt to push ISIS out of the northern suburbs of Samarra. So why is al-Maliki going north to Tikrit rather than west to Falluja and Ramadi in al-Anbar Province? Or east to Diyala Province? My guess is that the real prize here is Baiji, which has a refinery where much of Iraq’s crude oil is turned into gasoline. 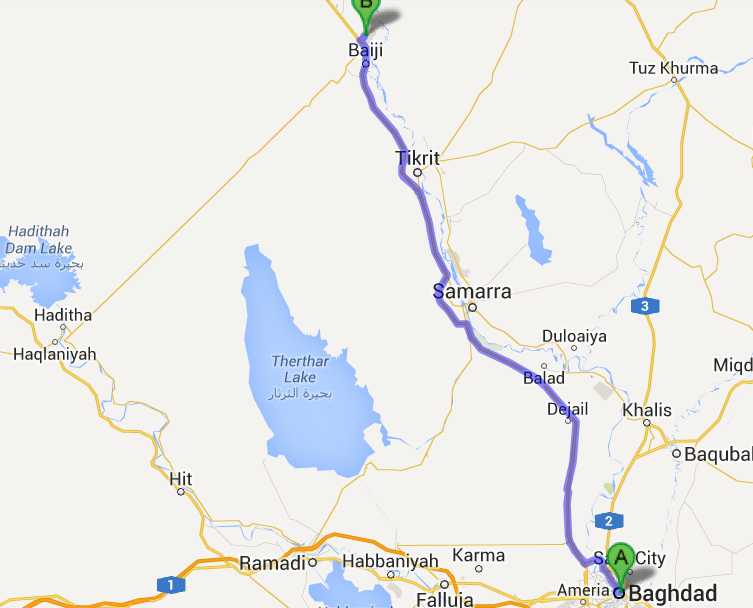 Al-Maliki can’t hope to survive if he doesn’t get Baiji back, and Baiji is the next big city north from Tikrit. In other words, it is, as usual, about the oil. (Crude oil is fairly useless and seldom even smuggled because it only gains real value after it is refined into gasoline or kerosene (petrol or paraffin). Likely, also, the Green Berets sent by Obama to Baghdad have helped the Iraqi army plan out this campaign strategically. 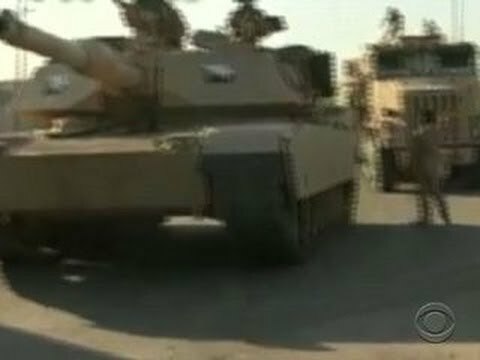 The attacking Iraqi armor (tanks) and thousands of infantry troops are getting good support, according to press reports, by helicopter gunships and fighter jets, the kind of coordination that has been missing as the army was pushed back by during the past two weeks by Sunni forces, many of them organized by the Islamic State of Iraq and Syria (ISIS or ISIL). ISIS fighters at first were holed up in the palaces of late dictator Saddam Hussein, who was born in Tikrit. Where they had massed in the city, they were subjected to bombing raids during the day on Saturday. There are conflicting reports about how far the Iraqi military was able to go in taking Tikrit on Saturday. The Iraq army is said to have taken the airport and then the local university. Independent reports seem to confirm that ISIS had been pushed out of the center of the city by Sunday morning. Even Al-Rafidayn TV, which has a Sunni fundamentalist editorial line, reported that the Iraqi army had expelled ISIS from the governor’s offices and killed some 60 of them, including some ISIS commanders. It quoted Ahmad Abdullah al-Juburi, the governor of Salahuddin Province. It also underlined that the army was supported by “Popular Brigades” of irregulars, presumably Sunni tribesmen who prefer Baghdad to the extremists of ISIS (or who have been paid well to so choose). Despite Sunni alienation from the al-Maliki government, there is a significant Sunni power elite that had been allied with it and benefited from it. Atheel al-Nujayfi, the governor of Nineva Province, is also seeking to raise a force of Sunni irregulars to expel ISIS from his own city, Mosul. The Iraqi air force also bombed Mosul on Saturday, targeting ISIS positions, and it received the first shipment of used Russian fighter jets. The political context for this campaign is that many Iraqi political forces blame al-Maliki for losing a third of the country because he did not reach out to the Sunni Arabs. Shiite spiritual leader Grand Ayatollah Sistani has hinted broadly that Iraq needs a new government, and is pressuring politicians quickly to settle on who the speaker of parliament, president and prime minister will be before parliament convenes on Tuesday. Sistani is afraid that parliamentary deliberations on filling those key leadership posts will drag on interminably, as they did in 2010, Belgian style. That kind of political paralysis could mean the end of Iraq. Al-Maliki’s people point out that Sistani has not explicitly rejected al-Maliki, which is true. But the hints are pretty broad. Secretary of State John Kerry, on the other hand, appears to have convinced King Abdullah of Saudi Arabia to drop his demand that al-Maliki go as a precondition for the Saudi government to pressure Iraqi Sunnis to turn against ISIS and support the central government in Baghdad. Al-Maliki, a staunch Shiite, has long harbored resentments against Wahhabi Saudi Arabia, the state religion of which takes a hard anti-Shiite line. Kerry is said to have tried to impress on the king that if Iraq breaks up and some fragments bordering on Saudi Arabia are ruled by a wannabe al-Qaeda affiliate, his crown might rest uneasily on his head. Al-Maliki believes that the king was one of the financial backers of ISIS in the first place, and now chickens are coming home to roost. It is more likely that ISIS funding comes from Sunni fundamentalist private businessmen in the Gulf, especially, it is alleged, those in Kuwait.